Lie-Nielsen’s tapered molding plane iron blanks include 9 blades specifically designed to cover all the widths necessary to create a full set of Hollows and Rounds (18 pairs), and also blanks that can be used to create an almost unlimited number of profile irons for other planes. To accommodate a wide variety of planes each of the bits are slightly wider than one would typically expect for their tang width. One should expect to cut or grind the bit to the appropriate width for your plane. * O-1 Tool Steel, unhardened. a full set of Hollows and Rounds (18 pairs). 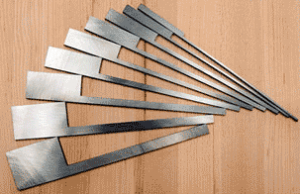 * 5 blades designed for Rabbeting planes from 5/8″-2″ wide. * 8″ (20.32cm) total length. * Bit length of 2 3/16″ (5.55cm). * Tapered from 1/8″ (3.17mm) to 1/16″ (1.58mm) over total length. To learn more about LIE-NIELSEN -TAPERED MOLDING PLANE IRON BLANKS CLICK HERE. If you’re interested in replacing or making your own wooden hand planes an undeniably useful resource in the process is Larry Williams’ DVD – Making Traditional Side Escapement Planes. * 180 Minutes, DVD. Lie-Nielsen Toolworks Productions, 2007. * Topics include blade making, hardening and tempering. * A must for all looking to make their own wooden hand planes. To learn more about Larry Williams’ DVD – Making Traditional Side Escapement Planes CLICK HERE. Hey Matt, have you tried any of these plane blades yet? Im looking into making a small set(maybe a 1/4 set) of hollows and rounds, just wondering if you had the chance to try these or not.